Millions of children in India beg and live a miserable life day after day. This journey starts right from their infancy when their mothers carry them around, begging. By giving these children money, we are not helping them but we perpetuate a cycle of poverty and give children a strong incentive to stay out of school. Keeping this in mind, Door Step School participated in an ‘Anti Child Beggary Campaign’ organised by Action for the Rights of the Child (ARC) on account of International Child Rights day on 20th of November 2015. 12 members of DSS staff and 5 volunteers participated in this campaign to spread awareness among the citizens to not give alms to the children thereby discouraging child begging at 5 signals in PMC and PCMC area, from 10:00AM to 1:30 PM. 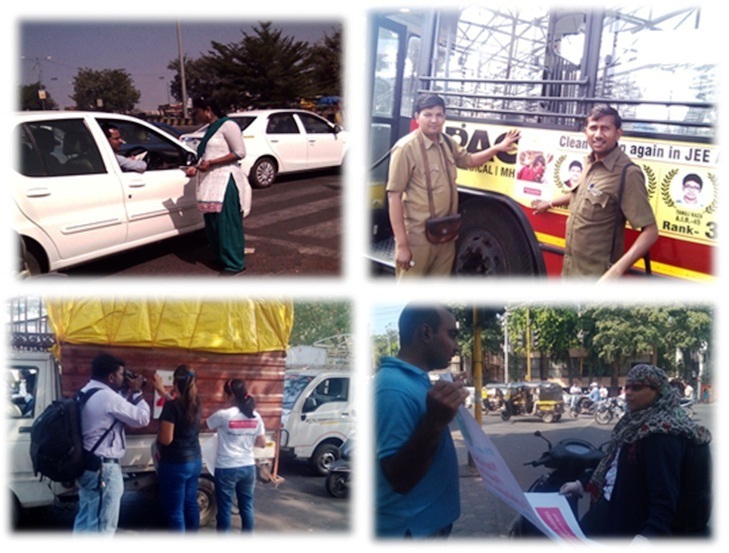 Citizens were made aware by word of mouth, by putting up stickers on vehicles, and by distributing pamphlets. A lot of citizens showed interest and were curious to know more about the campaign. They were also enquiring as to how they could contribute further to the cause.